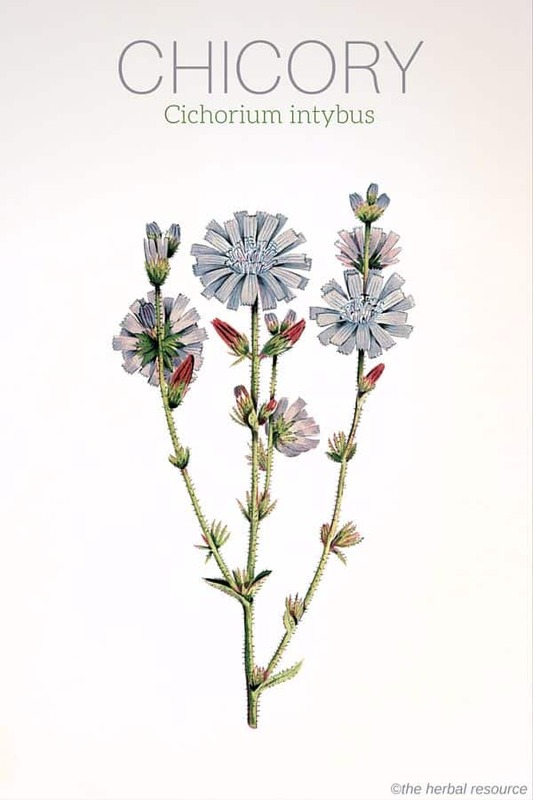 Botanical Name: Cichorium intybus L.
Other Common Names: Common chicory, wild chicory, coffee chicory, coffee weed, succory, wild succory, blue saisy, blue sailors, achicoria (Spanish), sikuri (Finnish), Wegwarte (German), chicorée (French), cikoria (Swedish), cikorie (Danish). 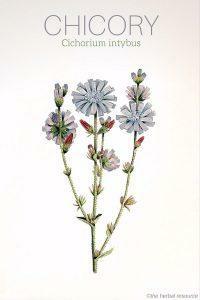 Habitat: Chicory is found growing wild in Europe, North Africa, and West Asia. It has been introduced to North America, where it has locally become naturalized. Chicory commonly occurs as a weed along roadsides and trails, in landfills and dry meadows. Description: Chicory is a perennial plant belonging to the Compositae family (Asteraceae). It can grow to about 1 meter in height. A variety of chicory (Cichorium intybus var. sativum) is cultivated for its root and often used as a substitute for coffee. This variety has a powerful, fleshy, yellowish taproot which can weigh over 500 grams. Wild chicory produces roots that are long and branched. First, the plant forms deeply toothed leaves in a rosette similar to the leaves of dandelion. The leaves are hairy on the underside. From the center of the rosette, the plant produces an angular, hollow, rigid stalk with outspread branches. The large and blue flowers, appear from July to September. They close in the afternoon and at the approaching of bad weather like before the rain. Varieties of the plant producing white or pink flowers exist. The entire plant contains a white latex with a bitter taste. Plant Parts Used: It is primarily the root that is used, but occasionally the whole plant. The roots are usually collected in the fall. The roots of the cultivated variety are first harvested in the second year. The roots are mostly dried by artificial means at temperatures of 40 to 50 ° C.
Active Ingredients and Substances: The root of chicory contains large amounts of inulin. 12 to 15% in the fresh root from wild plants (50-60% in the dried root of the cultivated variety). The plant also contains sugars (including fructose), pectin, choline, fixed oils (nonvolatile oils) and few bitter substances like sesquiterpene lactones consisting of lactucin and lactucopicrin also know as intybin. Other constituents found in the herb are tannins, mineral salts, vitamins B, C, K and P, coumarins (umbelliferone, cichoriin), phenolic acids (caffeine acid and ferulin acid, and esters of quinine acid), various flavonoids, essential oil, resin and other substances. Anthocyanin pigments are present in the flowers and are responsible for the blue color. The root was once widely used as a stomach-controlling agent, and many ancient medical books recommended it as a protection against dropsy and as medicine for diseases related to the liver and spleen. The plant juice was used traditionally as an herbal remedy for diarrhea, and the leaves and flowers were applied as a patch on boils and infected wounds, as well as a treatment for gout. In Scandinavia, chicory is mentioned in herbal medicine writings from the 1400s, as a medicinal herb that increases appetite and enhances digestion. In today’s herbal medicine chicory is considered to be of particularly great value as a tonic for the liver and gastrointestinal tract. The medicinal properties of the herb are similar to those found in dandelion (Taraxacum officinale). Chicory is viewed as an excellent bitter agent that increases the secretion of bile which in turn stimulates the appetite and aids in digestion. The herb has also the reputation for having a calming and soothing effect. Chicory is regarded to be effective as a natural treatment for gallstones and kidney stones, and the herb is well known as a remedy for jaundice, hepatomegaly (enlargement of the liver), inflammation of the liver and the urinary tract, and problems with the spleen. Some of the herb’s constituents have laxative properties. The herb is considered to be safe and mild enough to be used as a laxative for children. The bitter substances found in chicory are harmless so that it can also be used to treat ulcers, ulcers on the duodenum and minor internal bleeding. The bitter substances sesquiterpene lactones are believed to stop inflammation from developing and also halt an already developed inflammation. The substance lactucin and lactucopicrin have been tested against malaria. It was discovered that both substances were fatal to the malaria parasite, but lactucin was more effective since it was needed at a lower concentration than lactucopicrin. Just as dandelion, chicory has mild diuretic properties, and since it also promotes the excretion of uric acid it can be used for the treatment of rheumatic disorders, like arthritis and gout. Extract of the root has been shown to expand the walls of the blood vessels and could, therefore, have some antihypertensive properties. Chicory also lowers the levels of blood sugar. The herb might be a good choice for those suffering from diabetes due to the substance inulin, a polysaccharide present in high amount in the root. In the body, inulin is converted by hydrolysis to fructose. Today, inulin is used in many herbal remedies and it is thought to beneficial to the vital bacteria in the intestines by providing nutrition. Inulin is also believed to slow down the absorption of fast acting carbohydrates and also reduce the need for them, but currently, there is no clinical evidence that supports this. Externally the fresh leaves have been used to reduce inflammation and relieve pain and the plant juice has been used to remove warts. Chicory is an excellent herb to use in cooking. The succulent leaves and flowers can be added to salads and the young shoots can be used in pickle making. The young roots can be boiled like parsnips and served with a sauce or in soups. Chicory counteracts the stimulant effects of caffeine in coffee. Throughout the ages it has been used either as a substitute for coffee or as an addition to it, to make it last longer. As of yet, there is no published clinical evidence regarding the proper dosage of chicory when it is intended as an herbal medicine. Traditionally the common doses of the herb are 3 to 5 g/day. Chicory Coffee: After the roots are dug up they should be thoroughly cleaned and sliced into little cubes. Then they are placed on a rack and placed in an oven and slowly roasted until they are hard and dark brown all the way through. The roasted roots are then ground just like coffee beans. 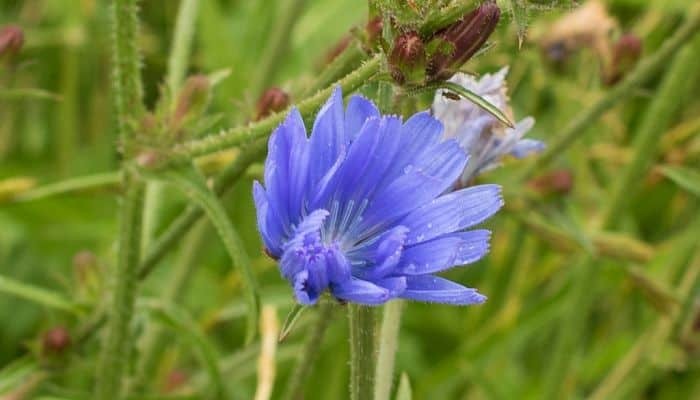 Chicory is considered a safe herb with but just a few warnings and possible side effects associated with the use of it. People suffering from gallstones should use the herb only in consultation with a professional healthcare provider. Excessively large doses can cause digestive and vision problems. The use of chicory is contraindicated in individuals with known allergies to plants belonging to the Asteraceae family. Allergic skin reactions can occur in sensitive people. The substances responsible for these allergic reactions are believed to be the sesquiterpene lactones. Cunningham, Scott: Cunningham’s Encyclopedia of Magical Herbs. St. Paul, Llewellyn Publications 2000.